Louisiana’s trucking industry is pushing for a state moratorium on new highway billboards, in part because truckers are angry about trial attorney road signs that demean truckers over injury claims. The proposals, Senate Bill 211 and House Concurrent Resolution 4, mostly are being touted as a way to make highways more scenic and trim driver distractions cited in thousands of accidents. A resolution, while different from a state law, can have an impact on government operations. Both bills face uphill battles, largely because they will run up against Lamar Advertising Co., a 117-year-old international firm based in Baton Rouge and one of the largest of its kind. “We are concerned about the impact,” said Hal Kilshaw, vice president of governmental relations for Lamar. The proposals are awaiting action in the Senate and House transportation committees. The two-month legislative session starts April 8. The group behind the push is the Louisiana Motor Transport Association, which has set up a page on its website that encourages viewers to urge House and Senate members to back the bills. The association represents about 350 trucking firms and has a visible presence in the Legislature, as does Lamar. Lamar has annual revenue of about $1.6 billion. Kilshaw said the company accounts for 80-90% of the state’s billboards, with trial attorneys responsible for nearly 1,000 of them. He said he has heard that the bills may be aimed in part at advertising by trial attorneys, who often target big trucks. “Obviously, we are not going to attribute any motives to the sponsors,” Kilshaw said. Kilshaw also said billboards offer a path, cheaper than radio or TV, for firms to get their message out and that company surveys show motorists are not bothered by the displays. Accidents involving big trucks are part of the pitches used by high-profile attorneys in Baton Rouge and elsewhere. 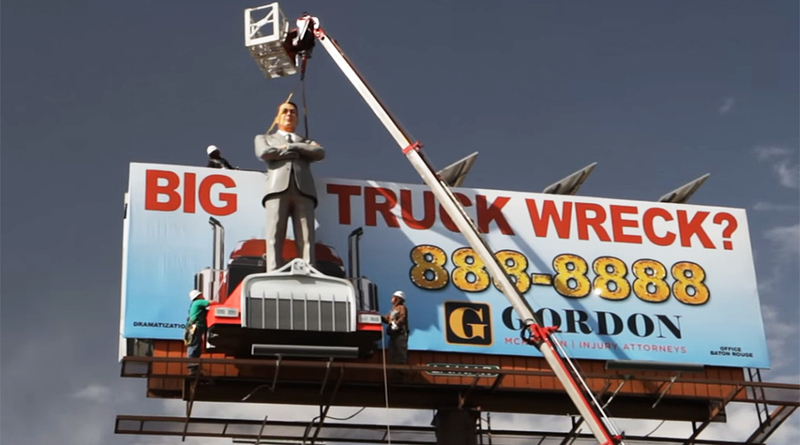 “You need an attorney who isn’t afraid to fight the big truck companies,” Gordon McKernan’s website says. In an e-mail, Calahan said his firm has no billboards and that he does not care for them. “I can understand why the trucking industry would be upset,” he said. Officials of McKernan’s firm did not respond to a request for comment. Permits cost $20. Truckers say the billboard industry pays the state about $145,000 per year, which is not even enough to cover administrative costs. McFarland’s resolution would increase costs of the permits. It would require billboards to be 2,000 feet apart, double the current rule, and be placed within 3 miles of the establishment it is advertising, a major sticking point for opponents. He said the state has ample authority to regulate the billboard industry through the state Department of Transportation and Development.